Is Officiating a Science or an Art? Volleyball referee training and the 3 Stages of Officiating. "No idea what just happened." This is where most start their officiating career. Just learning the ropes and trying to remember everything you ever heard about officiating a volleyball match. Basically just trying to remember when to blow the whistle. You gain confidence with every match you work and every whistle you blow. You continue to study the rules and watch veteran referee's and gain the experience necessary to move on to the next stage. You eventually progress to this stage after your first few seasons officiating. Once you gain more confidence, you enter the second stage of your career. "See everything - call everything." This stage is referred to as being the "scientific referee". You have a thorough knowledge of the rules and tend to apply those rules more strictly. This "tighter" approach to officiating sometimes makes players, coaches, and officiating partners a little uneasy. Black-and-white approach; few gray areas. May make participants (or partners) uneasy at times. This is when you've adopted a more "scientific" approach. A referee in this stage will more likely issue sanctions and more firmly stick to protocols and procedures. "See everything - Decide what to call/what not to call." Endeavor to reach this level. This is the stage where you probably will start to realize there is an "art to officiating". A combination of experience, common sense, rules knowledge and understanding, communication skills, integrity and decisiveness converge and you step into a new phase in your career. This is when you really start to "get it". Who is the person you go to when you have a question about an unusually situation that just occurred on the court? The officials you go to for answers are the stage 3 officials. What are these advanced officials like? These are the people who have a good understanding of not only the rules and the applications, but of the "art of officiating". They are trustworthy and knowledgeable. They bring about an easy feeling when you work with them. They are the kind of referee where every move is watched so you can learn something new. Know the spirit and intent of the rules to better apply them. Use common sense in decision making. Earn trust from participants and partners. 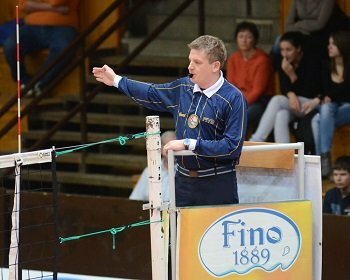 Some of the skills volleyball officials develop are similar to the skills officials in other sports develop. Just as there's an art to officiating volleyball, there's also an art to officiating other sports. For example, consider the skills of a basketball official. In basketball, the definition of a foul is "illegal contact with an opponent". Truth: Fouls under the basket are called differently than at the top of the key. Consider football. It's believed that there's holding on virtually every play. Football referees are taught which ones to call. Consider the wording used in the definition of a net fault: Interferes with play. Interferes with play is vague. The rule isn't black and white. Ball handling: Athletic plays and spectacular elements of the game. Most volleyball coaches and participants would agree to having the referee be like an artist. Not an engineer, scientist, or a mathematician. So how do you become an artist? Be a "technical referee" first. This helps you learn the right way to do things. Next, you can dissect the rules thoroughly to understand the spirit and intent. Get on court experience of all kinds at all levels. Know the role of the official in sporting events. Learn to contribute to the excitement of the match. The game is about the players not the whistle. Know when to enjoy the match instead of interrupting it. Recognize the emotional aspects of the game. Forever be a student of the game. Stay ahead of the curve, not behind it. When rules, techniques, or protocols change, be the first to grab the bull by the horns. Be a leader. Have knowledge of the volleyball world. Understand what is happening in other governing bodies of volleyball. If you don't, you are missing out on opportunities to learn, to grow, and to become an artist.